This entry was posted in Stocks Reservoir Fishing Reports on March 28, 2019 by staff. Congratulations to David Neilson who has beaten a strong field of anglers to win the Trout Masters Fish Off at Bank House Fly Fishery. He will now represent Bank House as our champion in the grand final, which will be held later in the year. David was on fire today landing a total of 23 trout! He switched between two methods to build this great catch. The first was striping back red apps worms with a varied retrieve, and the second was his own dyed chamois fished under the bung. He caught fish off every single peg. The other anglers in the match could generate takes but couldn’t match David’s conversion rate. David found that striking to side, rather than upwards proved to be more successful. Good angling David. In third place and suffering from a bout of loseyfishyitus was Andy Cooper. Andy had a frustrating morning but came on a late surge to catch 8 trout on his last four pegs. Andy’s catch included a nice fish of 6lbs. Paul Snieth had five fish on similar methods to David, Richard Moore had three on buzzers. This entry was posted in Stocks Reservoir Fishing Reports on March 24, 2019 by staff. Rod Average: 4.50 fish per angler. Sport: Friday the 15th was quiet at Stocks with strong winds keeping most anglers away. However a couple of hardy souls, namely Andy Harrison and Russell Fergusson braved the weather and headed down to the jetty area determined to wet a line. They were rewarded too. They kicked off with nymphs with little success, then switched to Di3 line and black boobies. They counted the line down to 10, then slowly retrieved the flies home. Andy landed six fish up to 4lbs and Russell had two. Well done fellers. Sunday 17th was a better day, reservoir was now coloured due to the amount of water brought by Saturday ‘s storm. We only had three anglers on the boats and the fishing was really tricky. Neil Heath landed one rainbow from Newclose, but it was a good one and tipped the scales to 7lbs. Karl Davis also had a fish on a Cats at the Dam. Everyday since, the colour has been dropping out of the water and the clarity and catches increased together. The first half of the week was hard going from both boat and bank. However during this period Gavin Murray managed 3 fish on two days in a row, using various lures fished near to the Jetty. Also Paul Miller took two fish from Bell Point one of which was tagged and won him a £100 tackle voucher. Good Angling Paul. By Thursday 21st things were picking up and a fresh stocking also helped to lift the sport. Ricky Newbolt had four fish to his boat from the Alders, however, it was in Hollins Bay where the best catches were caught. Matt Turner had 13 rainbows to Hollins to two trees. Matt used a small white lure on a floater. Ian Jackson had 11 fish on a bloodworm pattern fished on a nudge tip line. His best fish was a nice rainbow of 5lbs. Steve Mountain had 9 fish from the jetty area on a Cats variant, and Colin had 6 fish on a humongous from the same area. The good sport carried on into Friday too. Martin Friend had eight fish on a black lure, once again fished on a floater. Stuart Halford had 11 trout using an SSI lune and an orange blob and Colin Fitzjohn had 12 fish from the jetty area on small lures. This entry was posted in Stocks Reservoir Fishing Reports on March 23, 2019 by staff. This entry was posted in Stocks Reservoir Fishing Reports on March 21, 2019 by staff. Sport: My apologies for the lack of the reports for the last 11 days, but the extremely wet and windy conditions have kept almost everyone away. Paul and I have been getting plenty of bailing practice in though!! It looks as though good weather is due to return at the beginning of next week, so here is a summary of the last ten days or so. Towards the beginning of March, just before the weather turned, Andy Cooper and Rick Nuttall had a cracking day from the boat down at the Northern Shallows. They landed 32 trout between them on Dawson’s olive nomads and cats whiskers fished on long sink tips. They had rainbows up to 5lbs and found that a slow steady retrieve produced the most action. On the same day Pete Greenalgh took five rainbows to 3lbs on at black n green fritz fished in Hollins Bay. Then the weather changed, and angler numbers dropped off sharply. We have only had a handful of boats out over the last ten days as many days it hasn’t been safe to let them out. Those that did venture out only managed short sessions. Duncan Watson had six fish from Phil’s Flats on a black and green gold head and John Sykes managed a good half day during a lull in the wind. John took six fish on boobies fished on Di5 sinking line. He caught fish along the Northern Shallows to the Causeway. On Sunday we saw the Nomads take out 5 boats between them. No sooner had they got out and fishing when the conditions deteriorated into a blizzard with high winds. All of them were back on the jetty by lunch time and they decided admit defeat and to try again when the weather improves. I think their top angler was Steve Gildart with four fish, which is not bad considering. On the shore, a few anglers have ventured out on the better days with varying degrees of success. On the 9th it was great to see Myfanwy from Wales with his fishing buddies. 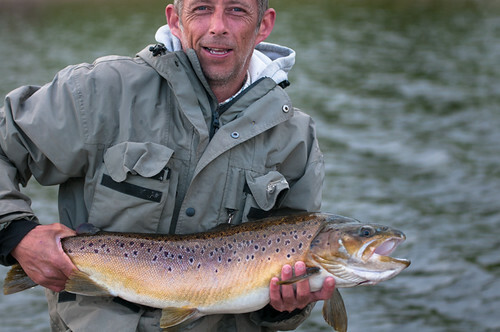 He was top rod in tough conditions with six fish all caught on an orange fritz nomad. Well done Myfanwy. This entry was posted in Stocks Reservoir Fishing Reports on March 14, 2019 by staff.